Check this page periodically for updates to BNAPEX 2018 convention information. Looking for a room mate to share hotel costs? Well look no more. Co-chairs Grégoire Teyssier and Jacques Poitras express their thanks to all for the successful convention. Images of a fourth souvenir cover and two stamp booklets are posted on the Souvenirs page. The souvenirs sold out at the convention. Illustrations of the BNAPEX 2018 souvenir covers and personalized Picture PostageTM stamps created by François Brisse are posted on the Souvenirs page. The Palmares is available. There were 24 Gold, 9 Vermeil, 12 Sliver, and 1 Silver-bronze medals awarded. The convention is fully booked, but you can view the exhibits, visit the dealers, and attend the seminars without registering. The BNAPEX 2018 souvenir covers and personalized stamps created by François Brisse are now ready. They will be available at the convention in Quebec City, 21-23 September! Deveney Stamps Ltd. of Penticton, BC, is joining the BNAPEX dealer bourse. See the Dealers page for a complete list of dealers at the bourse. 5 Rue du Fort, Quebec, QC G1R 2J0. Four other special cancellations as well as personalized stamps are under preparation, and will be available at the BNAPEX 2018 convention. 5 Rue du Fort, Québec, QC G1R 2J0. 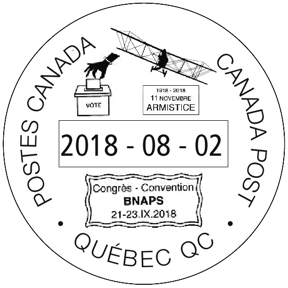 Quatre autres oblitérations spéciales ainsi que des timbres personnalisés sont en préparation et seront aussi disponibles lors de BNAPEX 2018 sur le site de l’exposition. The Montreal Transcript Covers: The First Use of a Reply Envelope? Tour 2, culinary experience - tour of 5 to 8 restaurants, and Tour 3, scenic cruise along the St. Lawrence River from Cap Diamant to Montmorency Falls, are fully booked. Unfortunately, no more booking requests can be accepted. Space is still available on Tour 1, guided tour of the Citadelle and old Quebec City. Eldon Godfrey is coordinating the seminar schedule on behalf of Bill Radcliffe, Vice President Study Groups. Contact Eldon by email at ecg@godfrey-godfrey.ca. The synopsis and/or title page has been added for five more BNAPEX 2018 exhibits. See the Exhibits page. The synopsis and/or title page is available for over half the BNAPEX 2018 exhibits. See the Exhibits page. The BNAPEX 2018 exhibits are listed on the Exhibits page. Several updates to the schedule of study group meetings & seminars were made. A preliminary schedule of study group meetings & seminars has been posted. Check the Seminars page periodically for updates. The meal choice options for the Saturday out at Huron-Wendat Hôtel Nation and the Sunday banquet were added to the registration form on 16 May. If you submitted your registration form before 16 May, you will be contacted by email for your meal choices. You do not have to submit a new registration form. During the countdown to the convention, the synopsis and/or title page of selected exhibits will be posted on the Exhibits page. The first two are now available. Check the Exhibits page periodically for future postings. The exhibit space is now fully subscribed. All 160 frames are booked. A waiting list is being compiled in the event that an exhibitor cancels. If you would like to be put on the list, contact the Exhibits Coordinator, Grégoire Teyssier, with details of your exhibit. 145 of the 160 exhibit frames have now been taken. Only 15 are still available. To ensure your exhibit is accepted, send your Exhibit Entry Form soon. The Initial Acceptance Period for submission of exhibits ended on 14 April. Of the 160 frames for the exhibition, only 60 are still available. To ensure your exhibit is accepted, send your Exhibit Entry Form soon. Note that Entry Forms MUST be received by 30 June. For more information, go to the Exhibits page. The Lieutenant Governor of Quebec, His Honour The Honourable J. Michel Doyon, and the Mayor of Quebec City, His Worship Régis Labeaume, will be attending the opening ceremonies of BNAPEX 2018. We advise members planning to attend BNAPEX 2018 QUEBEC CITY this September that the room availability difficulty at the convention hotel has been resolved. Rooms at Hotel Plaza are still available at the convention rate of $127.99. Should you have any questions about BNAPEX 2018 QUEBEC CITY or experience any difficulty making reservations, please contact Hugo Deshaye (email). Please book early to take advantage of the convention rate of $127.99. A third of the available rooms are already booked. The Exhibit Entry Form is now available online, and the Exhibition Prospectus has been updated. Both are available on the Exhibits page. The two documents were included with the 2018 First Quarter issue of BNA Topics . Initial BNAPEX 2018 Quebec web pages posted.